Perfect for use with the nasal wash system, Neti Pot Salt is 99.99% USP grade salt, the highest purity salt commercially available. It is non-iodized and contains no additives or anti-caking agents. Use a heaping ¼ teaspoon per Neti Pot use. 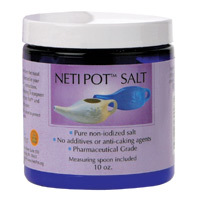 Neti Pot Salt is the highest purity salt commercially available. 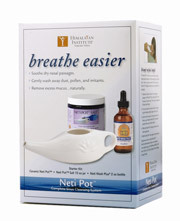 Traditionally, Neti pots are used with warm water and non-iodized salt to help cleanse and open up the nasal passages. This safely, gently and effectively rinses small particles and debris from the sensitive mucosal lining of the sinuses. Salt is astrigent and helps dry up excessive mucus production. Neti Wash Plus contains zinc and herbal extracts that add anti-microbial and anti-viral support to your nasal wash. Zinc helps to tone and astringe the nasal passages reducing excess mucus and promoting clear, healthy sinuses. Studies show that Zinc reduces the duration and symptoms of the common cold, slowing the replication of rhinoviruses which typically cause colds. Neti Wash Plus contains Zinc Acetate —a form of Zinc shown to be more effective than other types in shortening the duration of the common cold. Neti Wash Plus also contains extracts of Grapefruit Seed and Goldenseal Root, found by scientists to inhibit the growth of hundreds of strains of pathogens. Grapefruit Seed Extract has been used by the natural foods industry for over 20 years as an antibiotic, disinfectant, and antiseptic. It is perfect for use with the Himalayan Institutes Neti Pot. Ingredients: Zinc acetate, Goldenseal root (Hydrastis canadensis), Phellodendron bark (Phellodendron amurense), Coptis root (Coptis chinensis), Barberry root bark (Berberis vulgaris), Grapefruit seed extract, vegetable glycerin and distilled, microfiltered, ozonated water. Convenient and economical, 4 oz bottle. Also available in a 2 oz bottle. This formula contains soothing herbal extracts, essential oils, and Xylitol to cool, decongest, and invigorate. It helps to nourish and moisturize nasal passages and provides anti-microbial properties to support the health of your sinuses. Aromatic Zinc-Free Neti Wash Plus contains 5 herbal extracts, essential oils of Peppermint, Eucalyptus, and Menthol and other ingredients that mildly cleanse and soothe the sinuses. It also contains Xylitol which research has shown to inhibit the growth of certain types of bacteria. Ceramic Neti Pot Starter Kit contains everything needed for a daily nasal wash routine—Ceramic Neti Pot, Neti Pot Salt 10 oz jar, and Neti Wash Plus 2 oz bottle. The Himalayan Institute introduced the Neti Pot 35 years ago as the perfect tool to support sinus health. The Neti Pot naturally cleanses, refreshes, and protects the nasal passages and has been used for thousands of years in Ayurvedic medicine to alleviate allergy and sinus problems. 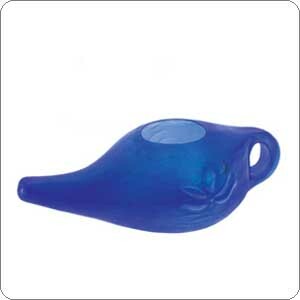 Ceramic Neti Pot™– The popular Ceramic Neti Pot makes nasal irrigation easy and comfortable. The trademarked lotus design and distinctive shape dispenses the perfect rate of flow to optimally cleanse the sinus passages. Made with lead-free ceramic and glaze. Neti Wash Plus®– Contains zinc and herbal extracts that add anti-microbial and anti-viral support to your nasal wash. Zinc helps to tone and astringe the nasal passages reducing excess mucus and promoting clear, healthy sinuses. The Blue Non-breakable Neti Pot™ is perfect for travel and is made with the same trademarked lotus design and distinctive shape as Ceramic Neti Pot™. It dispenses the perfect rate of flow to optimally cleanse the sinus passages. This Neti Pot is nearly indestructible and is now made out of a food grade and microwave safe material called High Density Polyethylene (HDPE). After much research it has been determined that this is the safest non-breakable material on the market. It is the same material that milk jugs and many other food storage plastics are made from and it can easily be recycled.